Since 1927 Alexander Schleicher Segelflugzeugbau has manufactured safe and efficient sailplanes and motor-sailplanes handcrafted from the highest quality materials. In our new 28 page brochure we would like to show clearly and vividly not only our current status but also provide some details about our production process. 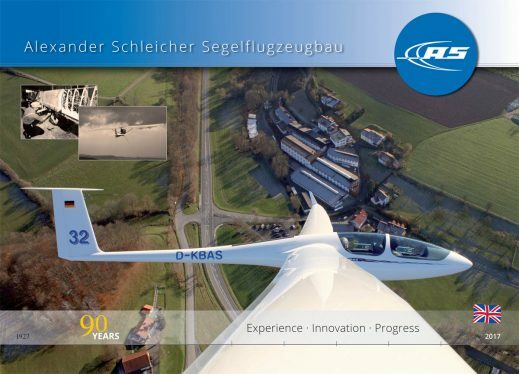 This includes information about the people who design and build our aircraft, the extensive and elaborate manufacturing process required to produce sailplanes today and also that so far Schleicher has built over 9500 sailplanes and motor sailplanes for pilots around the world.